Cars are generally only leased for the first few years of their life, but that doesn’t mean the car ceases to exist at the end of lease. The leasing company sells the car at the end of lease, sometimes to the lease holder who was already driving it. Whether you end up keeping it or not, you’ll want your lease vehicle to stay in pristine condition as long as possible. Below are some tips that will help you keep your vehicle looking and driving like new through the end of lease – and for many years to come. Keep it clean. You can’t let your car sit caked in road salt, bug juice and tree sap for long periods without consequences. Such grime can eat away at the paint’s finish and corrode exposed metal. 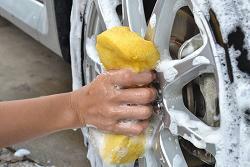 Wash your car regularly and include occasional deep-clean detail jobs. Avoid the sun. When you’re not driving the car, it’s best to keep it parked in the shade. UV light can cause the paint and upholstery to fade, and interior heat can dry out and crack your dash or door panels. Combine trips. Short drives are hard on your car, especially in cold weather. A short trip allows corrosive moisture to condense in the oil or exhaust system, without the car warming up enough to evaporate it off. Starting a cold car is also hard on the engine, battery and starter. Drive gently. Besides saving fuel, avoiding aggressive starts and stops saves your car from the strain that can cause parts to snap. Keep up with regular maintenance. Follow the manufacturer’s recommended schedule for oil changes, flushes, inspections and part replacements. Find a good mechanic. And once you do choose a repair shop, stick with them. Staying with one mechanic means that he or she will know what has been done to your car and what problems to look out for. If you’re looking for a lease vehicle to get you farther down the road or want to get out of your current car before the end of the lease, contact the experts at Swapalease.com. This entry was posted in Leasing A Car and tagged accelerate slowly, car maintenance, car repair shop, fuel economy, leasing a car, smart driving practices by admin. Bookmark the permalink.